Definition at line 20 of file CLUnresolvedReferenceException.h. Definition at line 16 of file CLUnresolvedReferenceException.cpp. Definition at line 27 of file CLUnresolvedReferenceException.h. 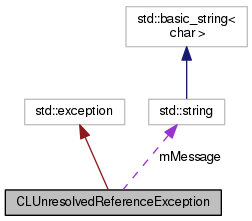 Definition at line 21 of file CLUnresolvedReferenceException.cpp. Definition at line 30 of file CLUnresolvedReferenceException.h. Referenced by CLUnresolvedReferenceException(), and what().